On my way to Florida this weekend I had a layover at the San Francisco Airport. 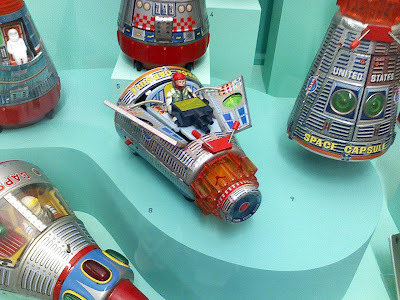 SFO has it's own museum that has rotating displays and right now they have one called Out Of This World! The 20th Century Space Invasion of American Pop Culture. Space capsules. Some of them look like they probably shot sparks, too. This one has a spaceman who pops out, which is cool. 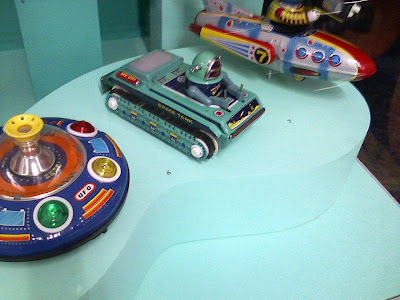 Space tanks are also important if one is going to explore space. Not sure how the research into space tanks is going these days. This is one of my favorite toys. If you look closely, you'll see that the space tank appears to have run over a Space Ape. The tank rolls forward and then every once in a while it rears up to reveal the ape beneath. 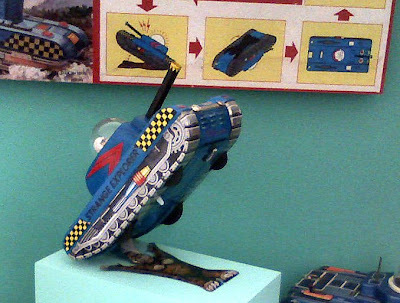 The tank is called "The Strange Explorer" and it has no patience for Charlton Heston's only natural enemy. 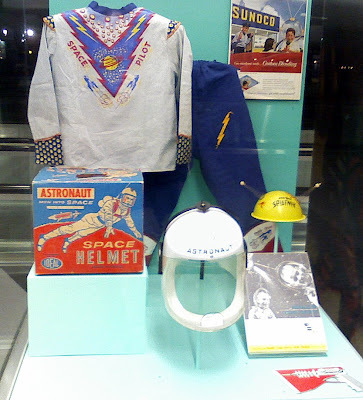 Tom Corbett's Space Academy. Cool. 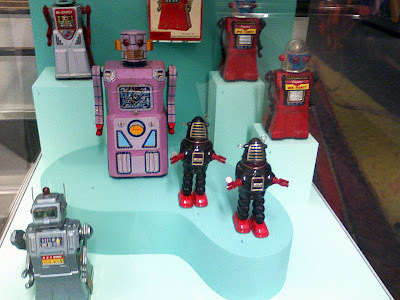 I didn't know there were any Tom Corbett toys at all. 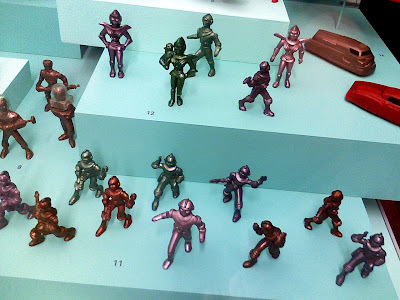 These are Archer's Space People. I couldn't get a good look at all the pieces, but some of the aliens are holding babies and there are robots and everything. I love this uniform, complete with lightning bolts. 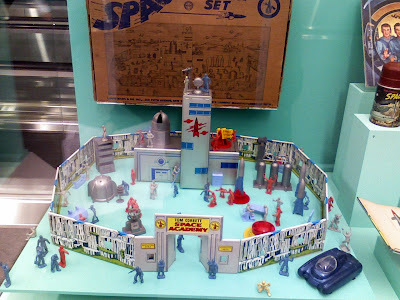 I could have been entertained for weeks with this and a large cardboard box to turn into a rocket. 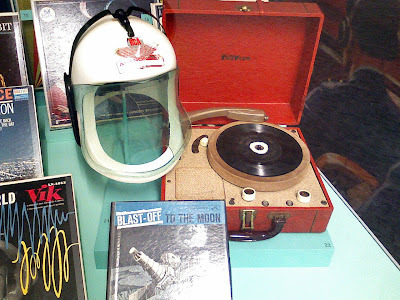 It was really unclear to me why this space helmet went with this record player. It appears it may be a space phonograph or something. 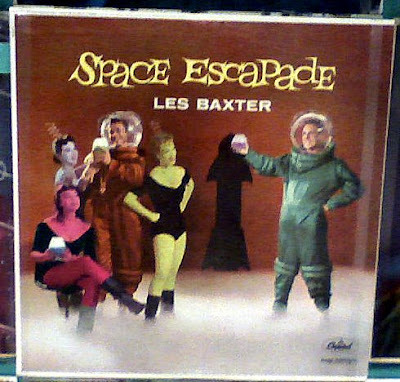 I had never heard of Les Baxter until I saw this record cover, but I like his style. Other albums of his that I'd like to see the covers of: Dr. Goldfoot and the Girl Bombs, Hell's Belles, and Music of the Devil God Cult. 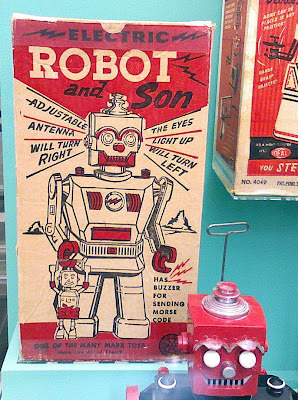 Especially cute robots that take care of their little ones, like "Electric Robot and Son." He can also send Morse code! 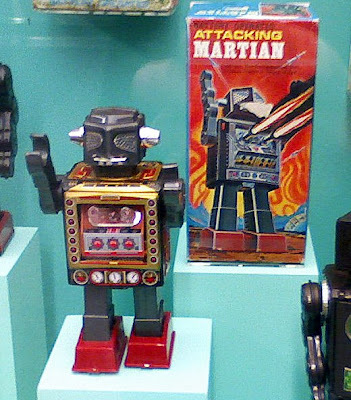 On the other hand, we earthlings are not as fond of marauding Martian robots. 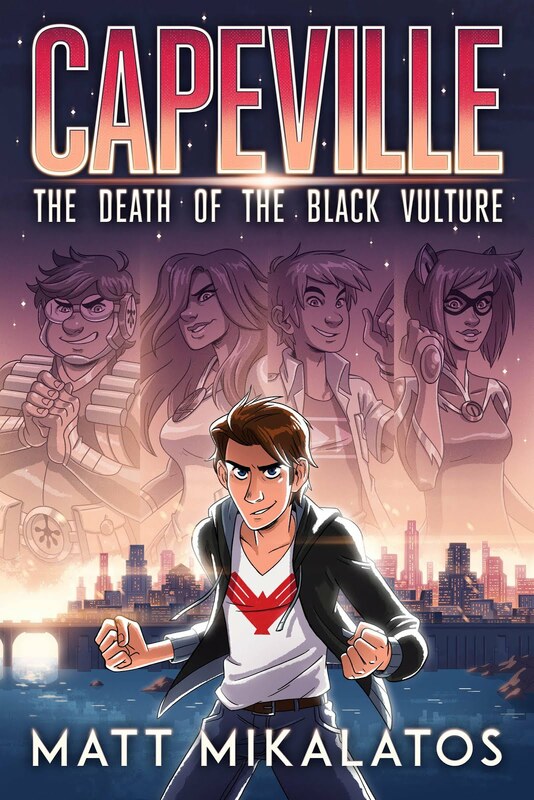 Luckily, the human race has the amazing "Mr. Hustler" to, uhhhhh... 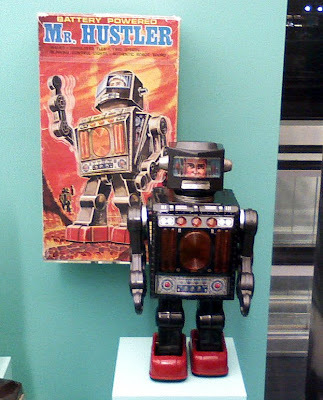 I am guessing "hustler" may have meant something other than what I am thinking of when they built this robot. Cyborg, whatever. 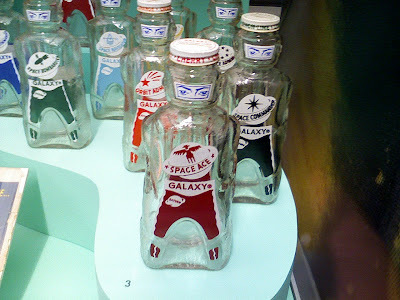 If the Martians beat the Hustler, they will drink our insides out like sodas. I feel cheated by the future. 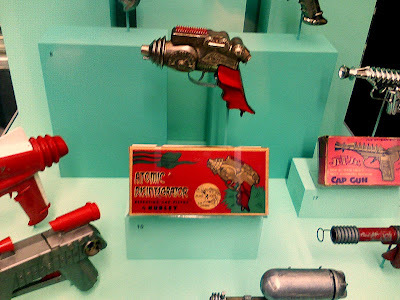 Where is my disintegrator? How can I fight space tyrants without one of these? I have to rely completely on Mr. Hustler. Grrrr. 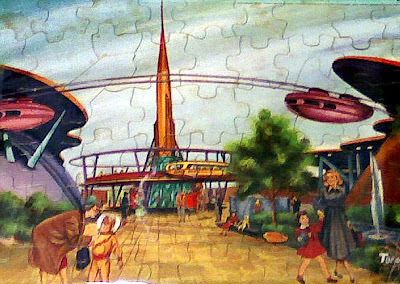 Here's a puzzle of Disneyland's "Tomorrowland" from the 50's (?). I think they should retrofit the whole thing to look like this again. 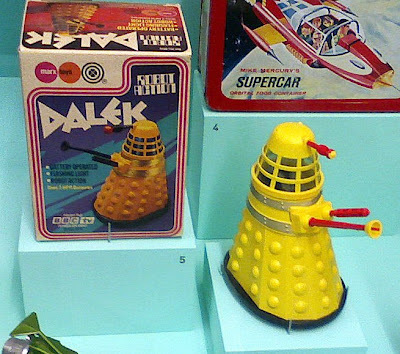 And what space toy collection is complete without a Dalek? Is there anything left to see there that you haven't posted? 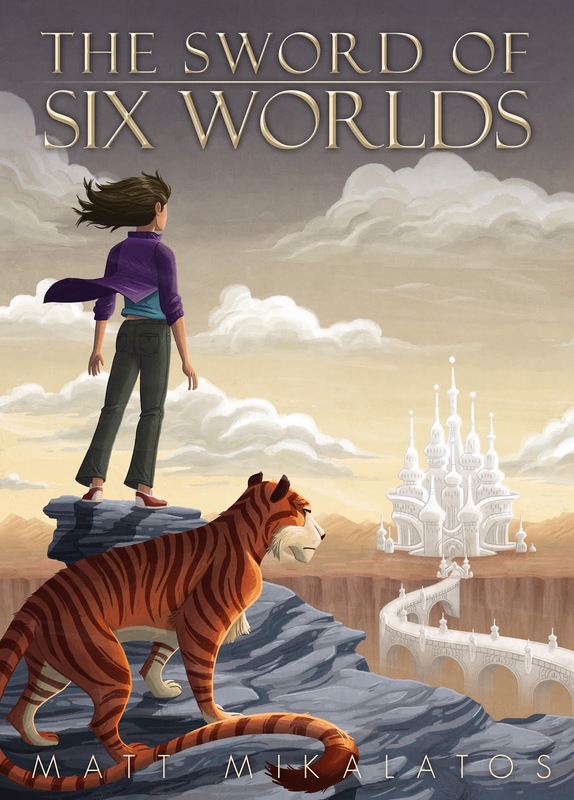 I mean, is there now any real reason to plan a flight through San Fran? I mean... I know "it's different in person" and all... but... wow... how long was your layover? Nonsense. This is but one small corner of the show. They had a live alien from Area 51, but no pictures were allowed.